I finished this over the weekend but the clouds finally went away and I was able to take some reasonable photos. 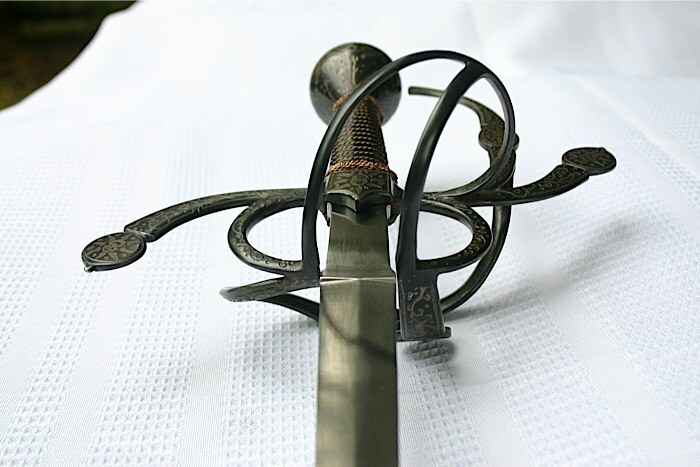 This is closely based on an English rapier in the Wallace Collection, number A597, although I took license with the counterguard, and based that on a sister sword, Wallace A596. I recently picked up Toby Capwell's The Noble Art of the Sword, and in addition to being a great read it has beautiful photos. 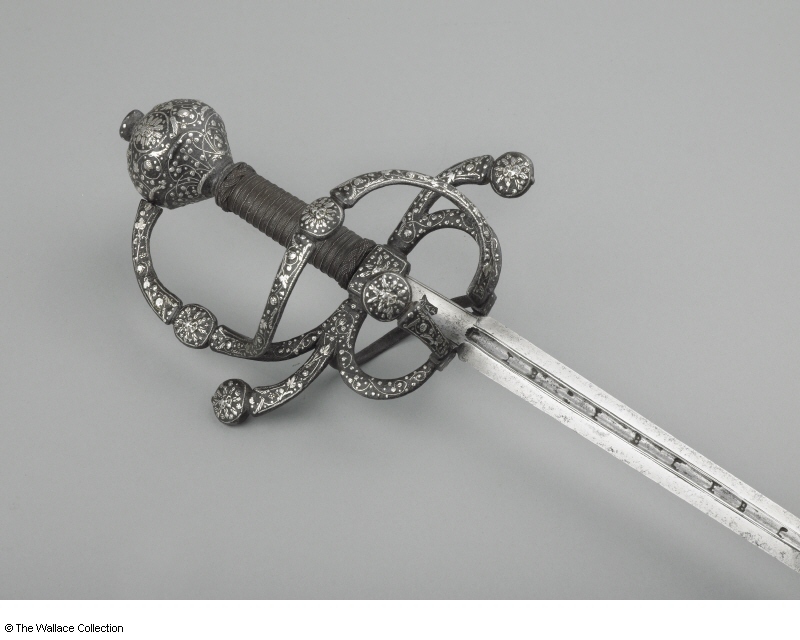 I'd seen this sword before in the Wallace Collection online catalog, but the big beautiful "real" pictures from the book made it really stand out. I kept eyeballing it, and eventually I just had to try to make something like it. I've never attempted anything with this kind/quantity of surface decoration, but I thought I would give it my best shot. It was an extended learning process on many fronts. I would like to give special thanks to Leo Todechini for mentioning the process of "brass brushing" here on the forum at exactly the right moment as I was deciding how to color/finish this piece. 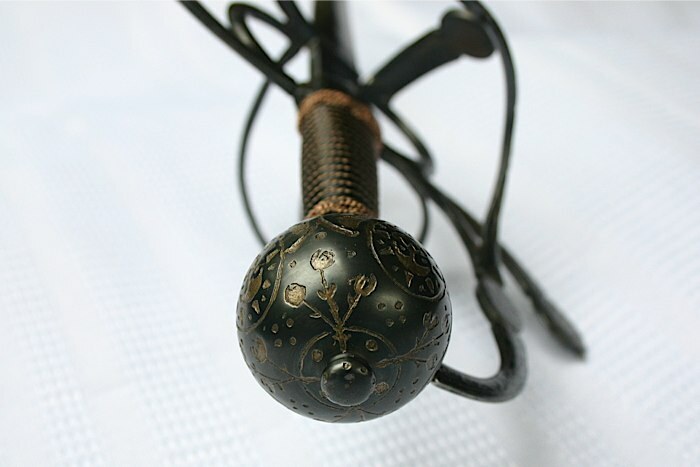 The hilt details are electro-chemically etched into the steel and then plated with brushed brass. The non-etched portions of the hilt are deeply blued. Coming up with a process for that took some time, as did making a second pommel and a third grip when the previous editions weren't quite right. Finding colored wire for the grip that matched the finished quality of the etching also proved tricky. The final sword is 42.25" long with a 36" blade. It weighs 2lbs 10oz. and balances exactly at the top of the hilt/ricasso. Arms & Armor used to offer a much closer re-creation of Wallace A597, which I'm sure i've looked at in the past but didn't even realize until after I'd finished making this. The photos of their version would have been helpful to have on my workbench, but maybe its better using just the primary source. That really does look fantastic. I applaud you pursuing this type of piece with such an array of new techniques. Very nice to see the results. wow, what a stunning work. 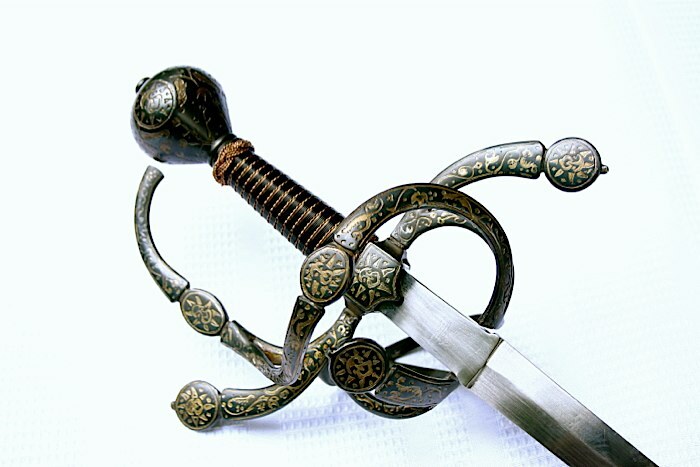 what makes a rapier especially english ? i suppose this is a category that was invented in recent years and played no role back then, but i already found in this book a "typically english rapier" and asked myself, what it might be. Very nice job on the hilt! Vincent, I totally hear you on the subject of blade length. 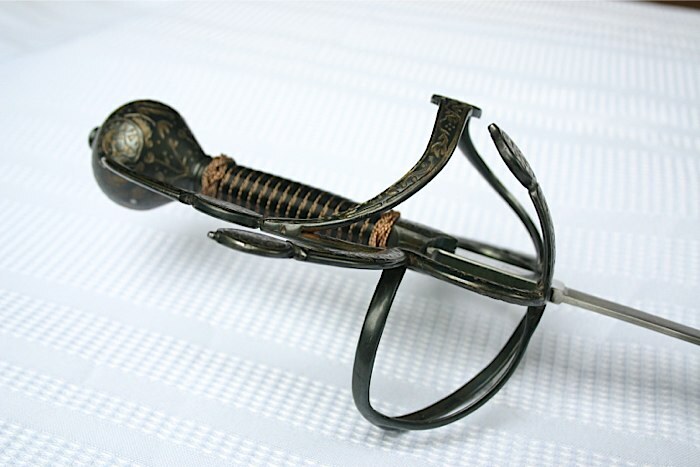 I don't make my own rapier blades so I'm functioning as a sword-cutler. I buy a blade, modify it, and make a hilt to match. 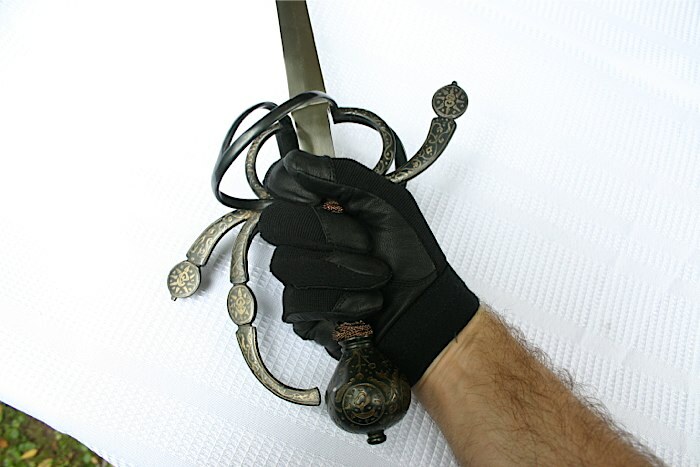 There are so many different kinds of folks buying rapiers and they all want different types of blades. 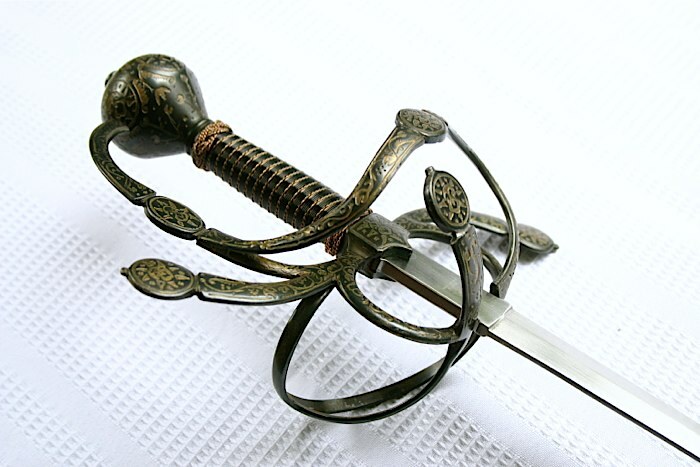 WMA folks are interested in long blades with certain types of flex, historical arms collectors may want a sharp blade, similarly proportioned to the original. 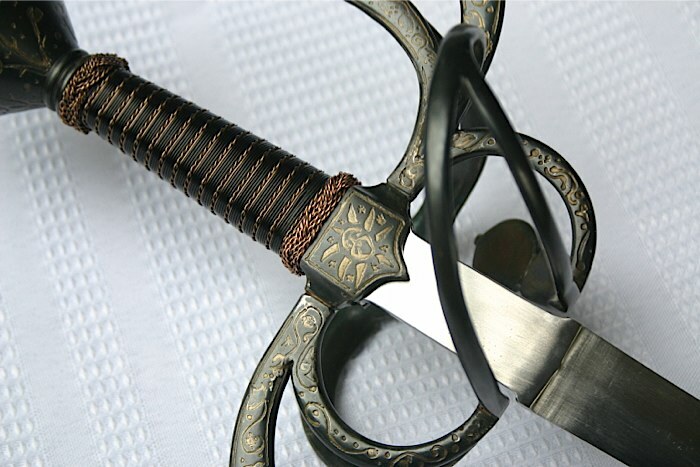 Stage combat practitioners usually prefer a shorter blade for their more theatrical style of swordplay, and they need it blunt but without the flex called for by WMA practice. 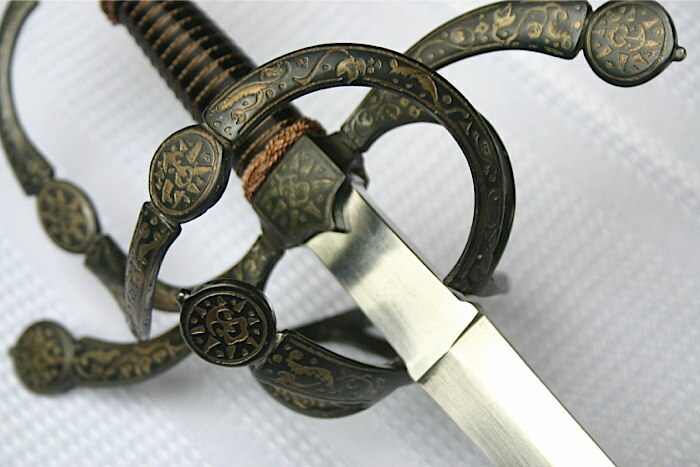 So, for me trying to sell a sword, there's no "right" blade to choose (if only!). 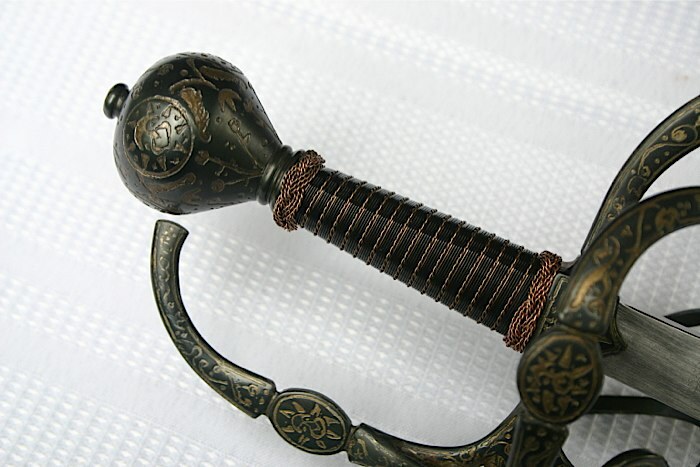 But, much like their historical counterparts, my sword hilts can be re-mounted to meet the needs of their owner. If you like the hilt but prefer a Darkwood or Arms & Armor rapier blade I can work with you and remount the hilt on a new blade. The cost will change, obviously, depending on the price of the blade, but I want to get you the blade that's right for you. 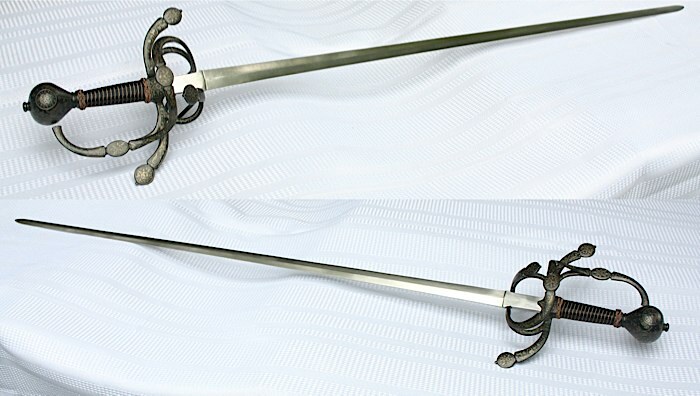 That goes for all my rapiers that are currently available, and any commission work of course. Don't like the blade? Pick a new one. I'll mount it for no additional charge beyond the price difference of the blades. Handling dynamics will change, but this can be managed. 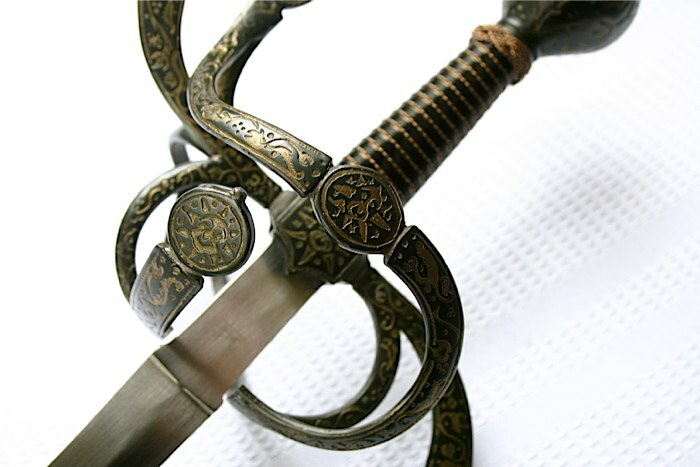 With the 36" blade on this particular sword, the balance point is right at the end of the hilt. That's a stage combat length with more swashbucklery handling. 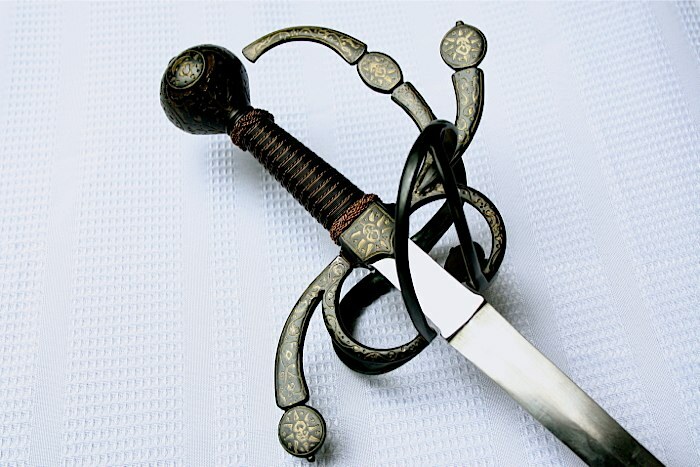 A WMA fighter would want the balance further out for more point-oriented rapier play, and a longer blade would accomplish that. I've been buying 43" Hanwei Practice rapier blades because at their price point they have a strong diamond cross section and a huge ricasso that can be cut down to various shapes. I find the last 6 or so inches at the tip a little thin and floppy, but when shortened the remaining blade has good flex and great visual presence. In short they are a good low-cost option that's highly customizable. I don't want to drop $200+ on a particular kind of blade, modify if for a specific hilt, and then find a customer who wants a different blade anyway.